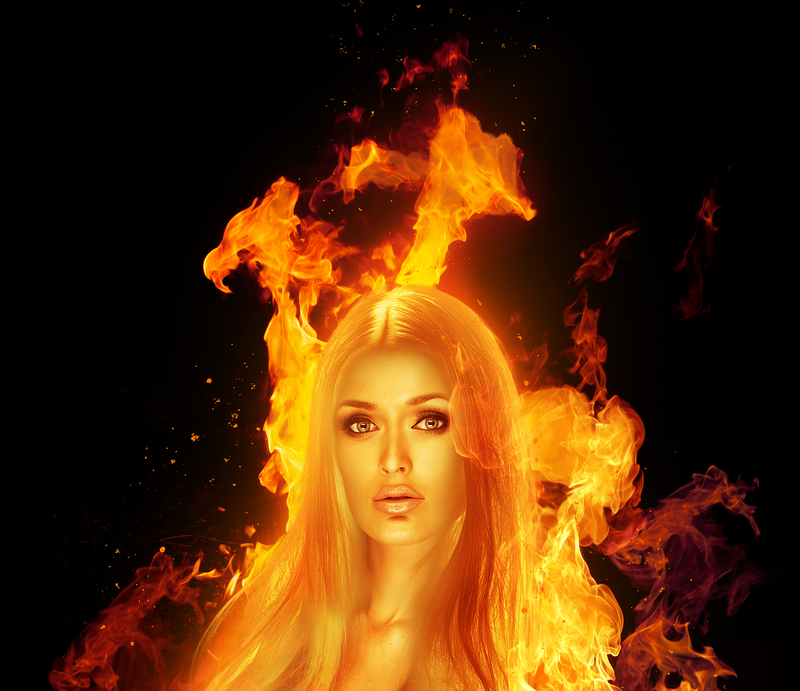 In this tutorial, we will be learning how to create a fiery woman! We will be using some age-old layer mode tricks, along with some newer adjustment layer effects! So this tutorial does assume you have intermediate knowledge of the various adjustment layers and layer masks. Note: At the end of each step there is an image of what my layers look like, at the point of that step, for when you get lost! First, we are going to prep our model (image #37946463) and background. 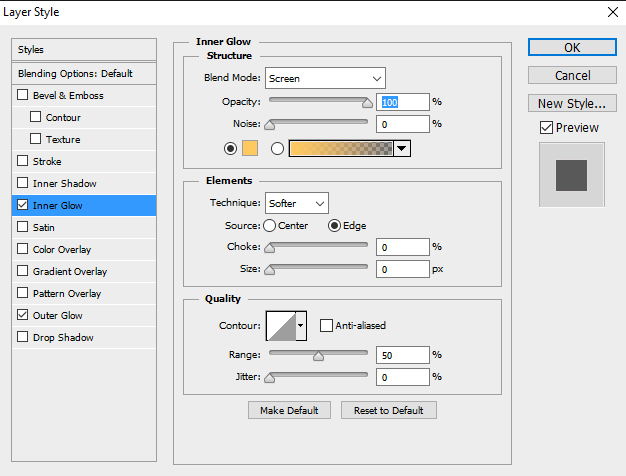 Create a Color Fill layer set to pure black. Then place and extract your model using your preferred method. Now we are moving on to the real effects. To create a red-hot skin look we will be using several adjustment layers. These layers should be ordered from top to bottom and all clipped into your model layer. Create a Curves adjustment layer, clip it into your model and set it to what you see below. That gives us our base color. Now we are going to give her a “red-hot” glow to her skin. 1. Create a Color Look up layer below your color balance layer. Set it to DeviceLink: Color Negative. 2. Create a black and white Gradient Map layer below that. 3. 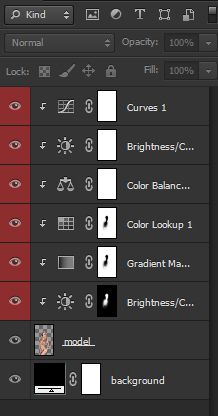 Add a Brightness/Contrast layer below the Gradient Map layer. Settings are Brightness -53 and Contrast 28. Now, we want to make her face clearer. To do this we will be masking out parts of the Color Lookup, Gradient map, and 2nd Brightness/Contrast layer. 4. 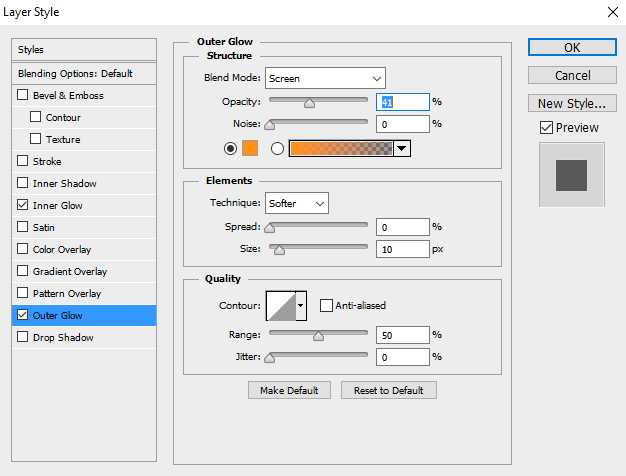 First, select your Color Lookup layer’s layer mask. Using a large, soft, round brush paint black over the girl’s face and chest. Here is a selection of the area I masked out. 5. Copy the layer mask you just created onto your Gradient Map layer by holding Alt then click and drag the mask onto the Gradient Map layer. 6. Copy that same layer mask on your 2nd Brightness/Contrast layer as well, but this time hit Ctrl+I to invert the layer mask. Next, we are going to give our model more highlights, along with adding an outer glow to really bring out her heat. 1. Clip and create new layer into your model. Set it to “Overlay”. 2. Using a soft, round, medium brush with a low Flow Rate, paint white on the edges, body and in the hair of your model. 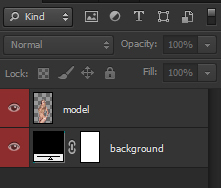 Below is my layer set to “Normal” so you can better see where I painted. 3. Create a new layer and clip it into your model. Keep it set to “Screen”. 4. Using the same brush as before, paint a light orange (#ff9643) on the edges of your model. 5. Create a new layer below your model. Set to “Normal”. 6. Using the same brush still, but with a very low Flow Rate (10%), paint orange (#f05700) around your model. We want a subtle glow. 7. Create a new layer. Set it to “Screen”. 8. Do the same thing as step 6, only this time using a more reddish orange (#ff3d20) and keep the glow closer to the model’s body. 9. Create a new layer above the last two layers you create, but still below the model, and set it to “Overlay”. 10. Using the same brush, paint white around your model, focusing more towards the middle of the image. Build up the light little by little until you have a strong glow. Now we will add out flames. We will be using a very simple “Screen” mode trick that will work with any fire image with a black background. 1. Find a few images of fire one a black background (image #16725489 and #9566562). 2. Place various fires on AND behind the model’s body. 3. Using a semi-hard round brush, mask out any parts of the fire that you do not want. 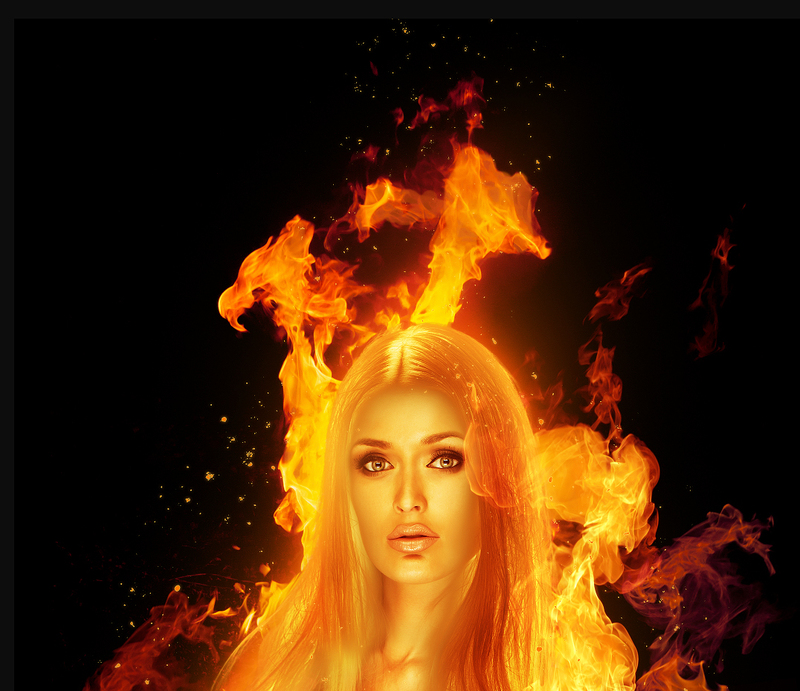 For instance, in my image, I masked out the fire to reveal the model’s left hand on the thigh. 4. Merge all your top flame layers together. Keep them set to “Screen”. 5. To alter the color of the flames slightly, clip a black and white Gradient Map layer into your now merged top fire. Bring it down to 25% opacity. 6. Clip a Brightness/Contrast layer above the gradient map. Set it to Brightness -19 and Contrast 33. 7. Above that, clip a Color Balance layer. Settings: Red 33, Green -45, and Blue -67. To make our fire pop more, we are going to make it seem more solid. We are also going to do some slight layer masking to blend the model’s body into the flames. 1. Create a new layer below your top flames layer. Set it to normal. 2. Using a semi-hard, medium, round brush with a low flow rate, paint orange (#ed732a) behind the bottom of the flames. This will make them seem less transparent and more solid. Do this with the flames behind your model as well. Add a layer mask to your model, then using a soft black brush mask out any part of your model that you want to be engulfed in flames. For me, it was her left arm. For out last detail, we are going to add embers surrounding the model’s body. 1. Above all your current layers create a new layer. Keep it set to “Normal”. 2. Using some kind of debris, snow, speckles, or particle brush (anything that produces a lot of tiny dots!) and your brush color set to orange (#fa7600), paint around model’s body. Finally, we are going to do some last color correction and add some overall atmosphere. We will be doing this using three different adjustment layers. They are listed from top to bottom, and all three should be placed over all other layers. 1. Create a Color Lookup layer and set it to “Drop Blues” at 52% opacity. 3. 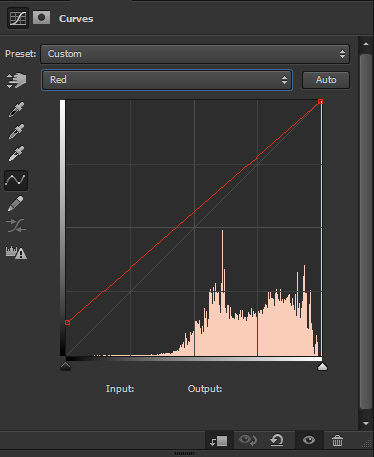 Lastly, create a Color Lookup layer above your last two color lookup layers and set it to “Soft Warming” at 31% opacity. 4. Group all three layers together and name the group “CC”. And you are done! Add as many flames as you would like, this is to just get you started. Remember, always experiment and never be afraid to try new and different techniques! Best Selling Stock Photos, Vectors, Audio & Footage Aug 2016! JOIN OUR CREATIVE CONTEST: Doodle on Your 2019 Calendar!